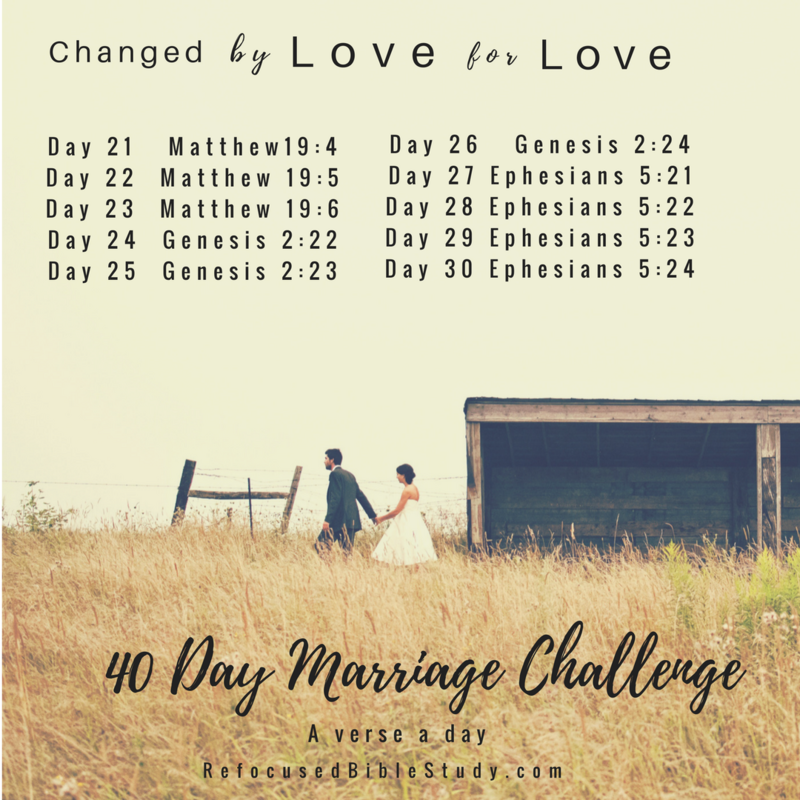 It’s Day 27 of the 40 Day Marriage Challenge here at Refocused! 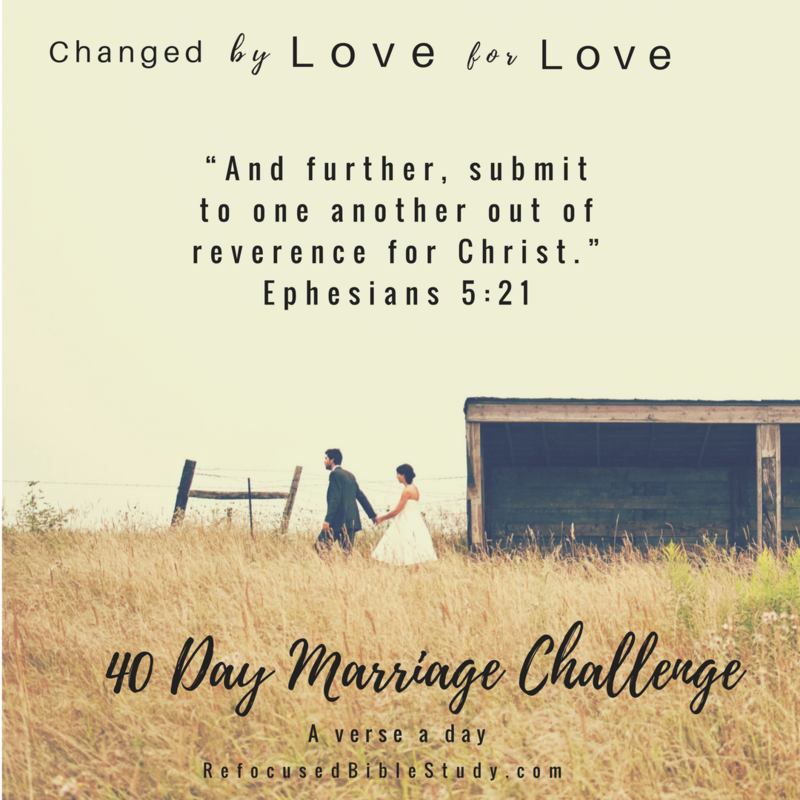 Join in with us and let’s finish strong seeking God daily to do more in our marriages. Today starts a controversial topic: submission. O- observations:The whole passage is really crucial to this verse. In light of the whole passage, what does submission really mean? Have you ever asked the Lord why he ordered our home in this way? Has he ever gently shown you the goodness of submission? Who should have the final say in decisions? Should we fight and stand our ground and not soften even if we can’t reach an agreement? There’s got to be a plan, some order to this thing. Thankfully, the Lord gave us that. Verse 21 starts us out having a mutual respect. Bending for one another and being compassionate toward each other. But… the next few verses show us the ultimate order of the home, created by God and modeled after Christ and the church. V- Verse’s implications for marriage: Don’t be your husband’s Holy Spirit. If he doesn’t agree with you on something, that’s OK. Share your heart about it with him. If you are in a hard cycle of communication heed the Holy Spirit’s advice on how to communicate. God is FOR your marriage! If you can’t reach an agreement let your husband move forward with what he thinks. Really try and love him well and see from his point of view. The goal is ONENESS in marriage. All other goals or reasons behind your point of view should be secondary. Trust God’s design for marriage. Trust his sovereignty, the ability to work out every detail. He is faithful all the time even if you feel like you have the “short end of the stick.” Ask him to show you how that is a LIE, and to show you how blessed you are. End in Prayer: Lord, Thank you for the gift of marriage. Thank you for being a beautiful picture of biblical submission by giving yourself up for your bride, the church. Please take away any negative connotations of submission. Please change our hearts and show us how beautiful submission in marriage can really be. Help us to trust your design for marriage. Bless all of the marriages represented reading these words. Grow them in more and more oneness in you.